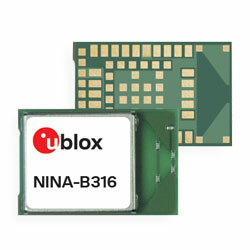 U-blox has launched its NINA-B3 series of stand-alone Bluetooth 5 low energy modules which now include the NINA-B306/316 modules with integrated PCB antenna. The trapezoidal printed antenna uses technology licensed from Proant AB, to allow excellent performance transmission and reception of data in a small form factor. The modules are fully pin and software compatible with the entire NINA series, providing manufacturers with a seamless upgrade path as well as design options. Dependent on the end application it may be more suitable to use an external antenna, while for many a PCB antenna will provide technical and commercial benefits. With its small form factor measuring 10mm x 15mm x 2.2mm, the modules give the company’s customers a greater design freedom.